Weight management company Nutrisystem has announced the launch of its NuMi app on iOS. The app was designed for the “do-it-yourself” dieter, and offers tools for weight loss and weight management, which are individualized for each user. 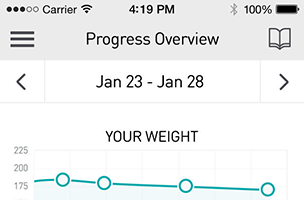 The app’s behavior modification system tracks everyday moments which may affect weight loss, including all of the little victories or hurdles one may encounter. “The NuMi digital weight loss system is designed to take real life into account on the journey to lose weight. It’s not focused on any particular nutrient, ingredient or food group. It’s focused on an individual’s weight loss goals and changing needs,” says Nutrisystem. Using behavior modification technology, users see real-time insights and guidance as they slip-up, or as they make great strides towards their goals. The app’s personalization features adjust to reflect a user’s daily calorie goals and lifestyle choices, while also offering over 200 “everyday activity” suggestions based on the amount of time available, or a user’s location. NuMi offers 12,000 recommendations for healthy eating while at home, as well as menu recommendations for over 300 restaurants / chains. It also integrates with a variety of activity trackers and wifi scales to bring additional data into the user’s overall weight loss plan. The NuMi app is available to download for free on iOS (and is coming soon to Google Play), but requires a paid subscription to the service to access. Part of this subscription is the ability to live-chat on demand with a member of the “NuMi Squad,” who will work to motivate users, or simply provide a listening ear. “We developed an interactive system that is far more than a prescribed diet, a tracker or calorie counter. NuMi is designed for today’s DIY dieters as they go about their daily lives – whether they’re at home or at a restaurant, in the mood to exercise or feeling sluggish, looking to lose 5 pounds or 25 pounds.” adds Aditi Gokhale, Senior Vice President & GM Digital at Nutrisystem. Check back soon to follow NuMi on AppData, our tracking service for mobile and social apps and developers.